Peridot and Tiger Lily! Thanks for participating in our poll. These were the favorites around here, so it was obviously meant to be. In other news, I finished the Spiral Effect Cowl in Peridot and all corrections are complete, which means it is now available for purchase so go get yourself a copy. I’ll wait.. I enjoyed knitting mine and will equally enjoy wearing them. Heather said hers took about 3-4 days to knit and it took me 10 days. 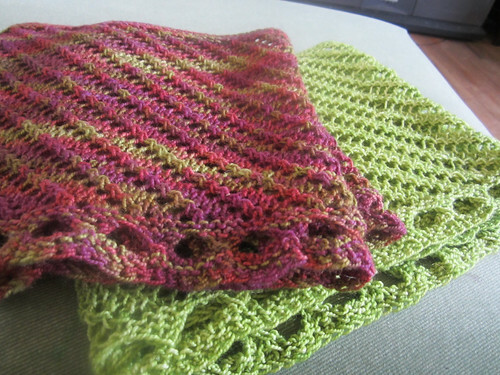 I am admittedly a much slower knitter than her, but 10 days for a scarf is not bad for me. Oh, here’s an interesting observation. 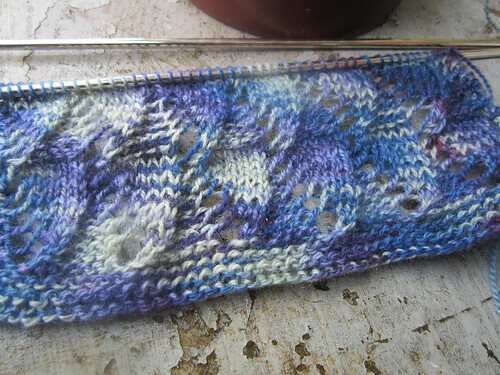 I think of myself as a knitter with a fairly tight and consistent gauge and have knit this yarn in lace projects using a 6US needle with good effect before, so when Heather had used that size needle, I didn’t question it and proceeded. Now, for things like sweaters, I am careful about gauge, but for things like shawls, scarves, etc..I don’t worry too much if I like the fabric I am creating. I did notice it felt a bit loose, but as we sometimes do, I ignored that and pressed on. I think it’s the openness of this lace in particular. 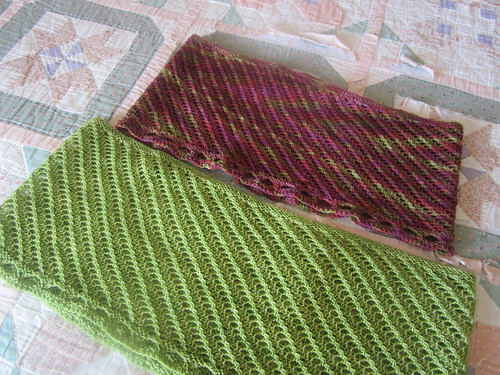 Now had I gotten out Heather’s sample and compared mine to hers sooner, I might have gone down a size or two, but I didn’t do that until mine was off the needles. Ignorance is bliss, eh? See the difference in size? Now, I knew that she tended to knit even tighter than me, and had I stopped to think about it I would have considered going down a size before starting. I am fine with mine, but I do kind of prefer the denseness of hers. It’s all good though, if for nothing else, as an object lesson that different knitters using the exact same needles, yarn and pattern, can have different results, no? Just something to keep that in mind when you knit yours. After casting off the cowl, I set right in on the Gust scarf in the Classic Merino Lace in our new hand-painted colorway Earthshine. We should have the new colors on the website possibly by the end of March, but by mid April for sure. I am knitting this on size 4US needles. As easy as this lace pattern is once you get into it, for some reason I have had to rip back three times getting this going. 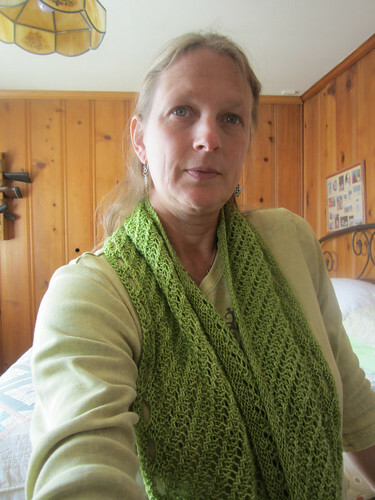 I have successfully completed two repeats now and don’t think I will have any more trouble now that I have re-familiarized myself with the pattern. I don’t even need the chart now, but I do need my glasses, LOL! 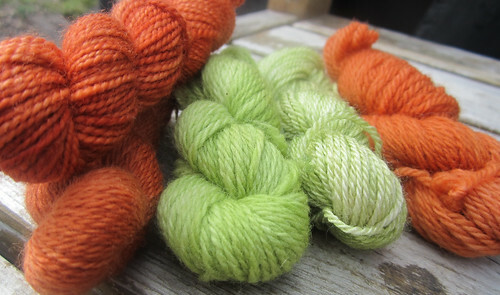 I am going to have to get into the habit of good lighting and wearing my glasses when I am knitting anything with stitch patterns and dark colors now. I think not doing so was part of my problem initially. My parting shot is one I took a couple days ago of our Forsythia bush, which is the first to bloom each year. 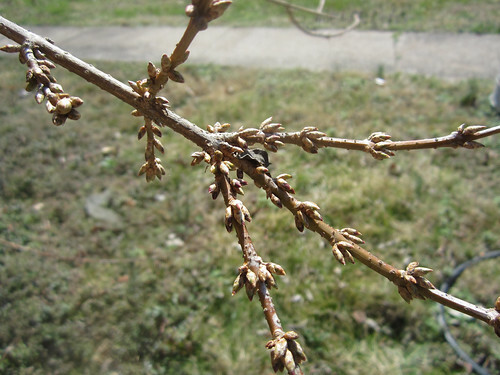 It is usually in full flower by mid-March, but it may be early this year. We have had the windows open some this week. Hurry up spring!